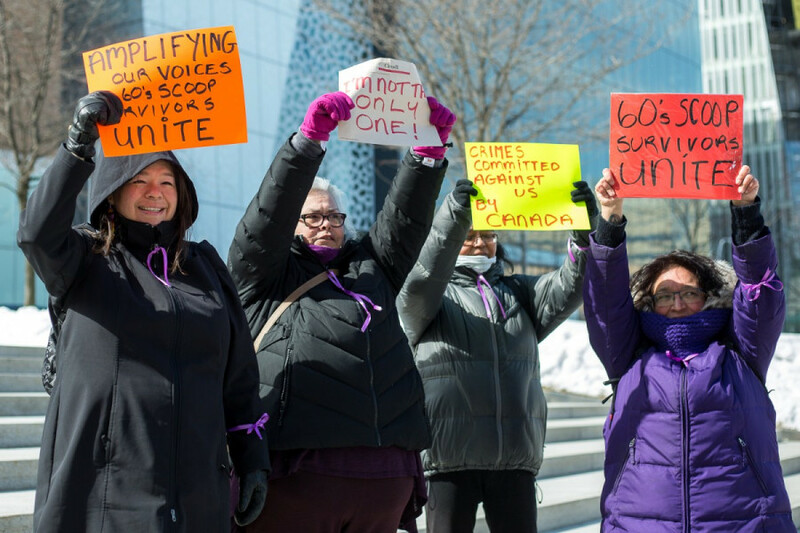 In a Montreal rally supporting survivors of the Sixties Scoop, impacted attendees shared their stories of being taken from their families at a young age and being moved by the government to a different side of the country. “My name is Clara Halliday. I’m from Manitoba and I was brought to Montreal at the age of three,” said survivor Clara Halliday. Other survivors chimed in, listing their place of birth, the age they were taken at and their destination of relocation. This was one of eight rallies held across the country Friday, in solidarity with Sixties Scoop survivors and to oppose a settlement proposed by the government for those impacted by these events. The small crowd of survivors huddled in the cold in Place-des-Arts. As some held signs and spoke of their experiences, others remained silent and stood beside fellow survivors in solidarity. “Amplifying our voices, 60’s scoop survivors unite,” one sign read. “I just want our voices to be heard,” said Sixties Scoop survivor Nina Segalowitz, of Inuit and Chipewyan descent, who was raised and adopted by a Filipino-Jewish family. The Sixties Scoop happened during the 60s, when the federal government took Indigenous children from their homes and placed them for adoption and assimilation into Canadian families, or into foster homes. Last year, the Canadian government proposed a $800 million settlement for thousands of children impacted by the Sixties Scoop, with the aim to resolve various lawsuits launched by the survivors. “The settlement is a settlement that’s been concocted by a group of people without my consent,” said Segalowitz. As journalists surrounded Segalowitz with microphones and cameras, she broke from answering questions to perform Inuit throat singing. Nakuset, a survivor and the executive director of the Native Women’s Shelter, shared some words with the crowd and media. She is notorious, among other survivors, for having reunited with her scooped sisters decades later. She added that this demonstrates that the public is more concerned and aware of the trauma Indigenous communities have faced. Along with Montreal, various other Canadian cities participating included Whitehorse, Ottawa and Vancouver. “Sixties Scoop survivors will stand united in demanding an end to colonial child welfare policies, a just settlement for Métis and non-status survivors and reparations of out of country survivors,” she said. This is the first time adoptees have gathered nationwide, Normandin later told The Link. An issue posed within the government’s proposed settlement is that it does not include non-status and Métis children that were affected by the Sixties Scoop, Normandin added.